Those who read the column I generated for the Spring 2017 edition of the GCCSEPM newsletter may recall that I started with some musings about whether anyone read these ubiquitous Presidential newsletter columns. So, the good (?) news is that some people do, as reflected in some emails I received and a few conversations I had with various folks. The bad news is that the numbers who said they read the column aren’t large...however, being as I am obliged to generate this one, and one more (!) I will carry on. In keeping with the theme from the last column of the effects of the deep decline in oil prices and ensuing serious downturn of the petroleum industry, I thought it would be worth a look to see what effects there have been on geoscience society membership trends. Our parent organization, SEPM (the Society for Sedimentary Geology) National/International, carried out some surveys of its membership last year as part of an effort to look to the future. This is a brief summary, and a more complete discussion can be found in December 2016’s The Sedimentary Record. In short, the SEPM has 2867 paying members as of June 2017, down from 3739 in 2010. That in turn was down substantially from earlier in the 21st century, as well as in the 20th. SEPM membership has been declining steadily for many years but has been essentially flat over the last couple of years since the downturn began in late 2014. This decline probably reflects the changing demographics of the petroleum industry, as well as the overall struggles of sedimentary geology in the academic world. 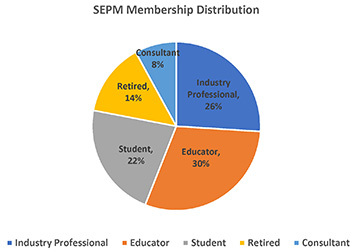 The overall current distribution of the SEPM membership is shown below. How does the overall SEPM membership and its current trends compare with the regional Gulf Coast Section of SEPM? At this writing, the Section has some 333 paying members, or about 12% of the membership of the parent organization. That number is a bit misleading, as our current records show that only about 1/3 of the GCSSEPM members also belong to the parent SEPM, an interesting bit of information. As an aside, I am one of the dual members. The employment distribution of our membership is shown below. The comparison to the parent society is not direct, as the data were collected differently and the Section numbers are identified and classified by myself from physical and email addresses, while the SEPM numbers came from self-identification. Nonetheless, we can draw some interesting conclusions. The Section is dominated by Industry employees and Consultants who spend most of their time working for industry. The SEPM Industry Professional category above likely includes government geoscientists, which would make the Section industry-dominance still greater. This does not come as a major surprise, being as we are the GULF COAST Section of SEPM, located in the heart of the USA petroleum industry. The GCSSEPM does not differentiate student members in its statistics, so the “Academia” category lumps together students and professors. Adding together the SEPM Educator and Student categories, SEPM has about 52% academic members vs. 17% for GCSSEPM. This likely is the reverse of the Industry dominance of GCSSEPM. The SEPM Retired category is also larger than that of GCSSEPM, possibly explained by some Section retirees who continue to consult, or conversely by SEPM retirees simply continuing to pay their dues for longer periods. 13% of our Section did not report an employer or email address that would allow the determination of their employment/function. Many of these may well be displaced and/or retired professionals. 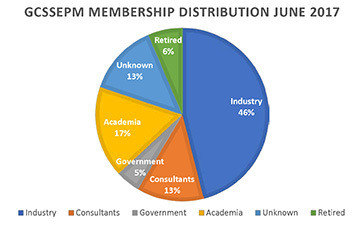 Another major difference between the SEPM and the GCSSEPM lies in the percentage of foreign (or non-USA) members. SEPM reports that about 35% of its membership comes from international locations, while only 17 out of 333, or 5%, of the Section’s paid members have identified as non-USA residents. Surprisingly, the largest foreign contingent comes from the United Kingdom (5), followed by Canada with 3. Brazil and Nigeria provide 2 each, and Colombia, China, Trinidad and Tobago, Korea, and Mexico each has one. Given the close geographic proximity and the shared Gulf of Mexico basin, it’s a bit surprising that Mexico has only one member in GCSSEPM. This represents an opportunity for GCSSEPM and we welcome any suggestions as to how to make connections with our Mexican colleagues, as well as other international prospects with interests in the Gulf of Mexico Basin. But what about any effects of the present downturn on GCSSEPM membership? Interestingly, our records have not yet shown any serious impact. The balance between membership lapses and new members is actually positive over the last 3 years. We have not been keeping yearly membership numbers for a while, but some legacy records show that our membership has tended to follow oil prices. Section membership hovered in the 200s and 300s during the 1950s and 1960s. The 1950s downturn was before my time (yes, really!) and I have only heard anecdotal reports of significant layoffs of petroleum geoscientists during those years. The membership data don’t seem to reflect those reports, increasing relatively steadily to 410 by 1974. 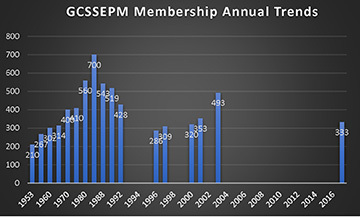 The mid-1970’s oil crises and ensuing price rise is reflected by a sharp jump in GCSSEPM membership, peaking at 700 members by 1984. Membership declined steadily amidst the harsh downturn of the late 1980s to 1990s (remember $9 per barrel? ), with a nadir in 1996 at 286. As oil and gas prices recovered, membership picked up to 493 in 2003, our last reliable annual membership total, but has since declined to its present 333. Our data are a bit spotty, to be sure. However, if the past is the key to the present, unless oil and gas prices recover from their current low levels, we will likely see further declines in membership going forward. Our Section would of course like to avoid, minimize or even reverse that trend, so please let us know what we can do to be more valuable to members. Now for some updates on the GCSSEPM’s major activities for the year, which all seem to occur in the latter half: President-Elect Thomas Demchuk, together with the Executive Council, is getting together a great slate of candidates to run for the offices of President-Elect and Secretary of the Section for 2018. You will be receiving email announcements and ballots in the near future. Please, please take the time to vote. I assure you that in this election, one vote really can make a difference. Every year, GCSSEPM’s major public outreach activity is a display at the opening of the Houston Museum of Natural Science Earth Science Week, introducing the public, especially children, to the wonders of geoscience. The HMNS web site lists this year’s events as commencing on October 14, 2017. This activity is always in need of volunteers. Contact Tony D’Agostino, the Executive Director of the GCSSEPM Foundation, for more information. The 2017 GCAGS Meeting will be held in San Antonio from November 1–3, 2017. GCSSEPM will participate in the Opening Ceremony, where we will present the 2017 Doris Malkin Curtis Award and the Distinguished Service Award, and recognize the recipients of the best presentations and papers from the 2016 GCAGS. The Section has been actively involved in generating the technical program for this meeting. As always, we have contributed to the abstract review and selection process, and are contributing to the review of papers for the GCAGS Transactions. GCSSEPM member Jon Rotzien was especially energetic in soliciting and organizing presentations for a 2-day deep-water systems symposium, which constitutes a very substantial portion of the 2017 Technical Program. The GCSSEPM Luncheon will be held on November 3, and will feature SEPM President Maria Mutti, who will present “Photozoan-Heterozoan Carbonate Systems: Evaluating Cenozoic and Mesozoic Examples.” Please see Maria’s abstract and biography here. This presentation is an update of a keynote talk from a joint AAPG-SEPM Hedberg Research Conference concerning “Latitudinal Effects on Sedimentary Systems,” held in Banff, Alberta in late 2014. Look for Maria’s review paper on this topic, which should be available online at SEPM.org later this year. An almost-free student short course will be presented by Bruce Hart and Carl Fiduk, to be held at Trinity University from November 4–5, 2017. A nominal charge will be assessed to cover the costs of lunches and refreshments, but Trinity is donating the venue, the GCSSEPM Foundation is covering materials and repro costs, and Carl and Bruce are donating their time and expertise, for which we are truly appreciative. Finally, the GCSSEPM booth will be on display in the Exhibitions, and we hope to see many of you there. The Perkins-Rosen GCSSEPM Research conference sponsored by the GCSSEPM Foundation is really the crown jewel annual event for the GCSSEPM. The Technical Program Committee (and the speakers and poster presenters!) for this year’s conference “Sequence Stratigraphy: The Future Defined,” have worked hard to put together a great program of oral and poster presentations. Early registration is now open. The program is still somewhat in flux, but we expect this conference to be a “technical success,” and are hoping for good attendance to make it a financial success, as well. Such success will enable us to continue to build toward resuming the Ed Picou Fellowship awards to deserving students, as well as provide for further activities going forward. I will close by reiterating that GCSSEPM is a volunteer professional organization, which needs participation from its members to succeed. Please let us know if there is anything we should be doing, and tell us whether anything that we are doing (or trying to do) is working. Anyone wishing to serve as a corporate or student representative should contact Vice-President Joe Macquaker. Go to our web site and click on the Contact Us button, and select anyone on the Executive Council to contact via email, or get in touch via LinkedIn. We look forward to hearing from you. Hayley Cooney, SEPM Membership Coordinator, provided the statistics for SEPM membership, and Gail Bergan of Bergan et al., Inc., and Norm Rosen of GCSSEPM provided the statistics on GCSSEPM membership. I remain responsible for transcription errors, as well as all of the analysis and interpretation/speculation.